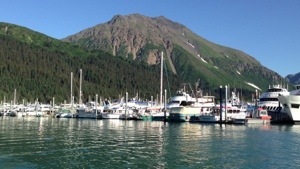 Resurrection bay fly fishing when the silver salmon are in is a great way to spend a day in Alaska. No wind and 75 degrees is a recipe for a great day on the salt. 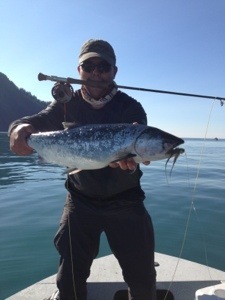 I was throwing a Jim teeny super magnum sinking line and was able to entice a lot of silver salmon to take the fly. Many other species were caught on bait and tackle but whenever I can entice a fish to take the fly it makes the day so much sweeter! Fly fishing or just fishing trips are available and we are happy to Getty lined up. Give us a call at 907-382-6808 or email is from here on the sight.